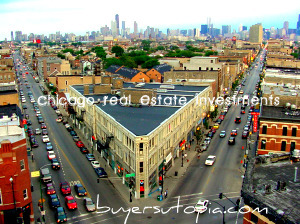 Buying homes as investment properties where they are fixed up and then a rented for cash flow has long been dominated by individual mom and pop Main Street type investors. But now Wall Street hedge funds, private-equity firms, pension funds and university endowments are entering the market in a very big way. The attraction for Wall Street is really simple, double digit returns at a time when most bonds and other income investments yield very little. The most popular strategy is for a big investor to team up with a local company that scouts out houses and finds the renters. 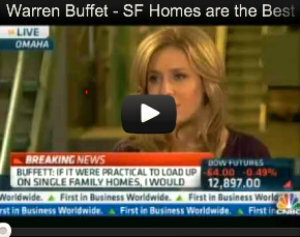 The hope is to manage a cash on cash return and eventually flip the homes in the future when prices recover. Any long-term REO to-rental strategy typically adopts extensive rehab plans as much of the non performing loans and foreclosed property that financial institutions are selling is not in market ready condition. Morgan Stanley analysts estimate that nearly 9 in 10 distressed homes are in no shape to rent out, in some key markets. This is partially because we are talking about older housing stockas the majority of these properties are more than two decades old. The importance of getting construction or specifically, re-construction or rehabilitation costs right cannot be overstated, it is vital to success. The quality and cost of rehab can continue to benefit or haunt the asset far past the initial completion of work. This is a truth for both local individual investors doing rehabs and the private equity companies aggregating for securitization. The reality is if you are a small Main Street investor or large Wall Street institution shoddy plumbing or other infrastructure work can result in significantly higher maintenance costs over time, and can also affect eventual exit pricing. Morgan Stanley estimates that renovations will cost about 25% of the purchase price and provide an internal rate of return of about 8.2%. 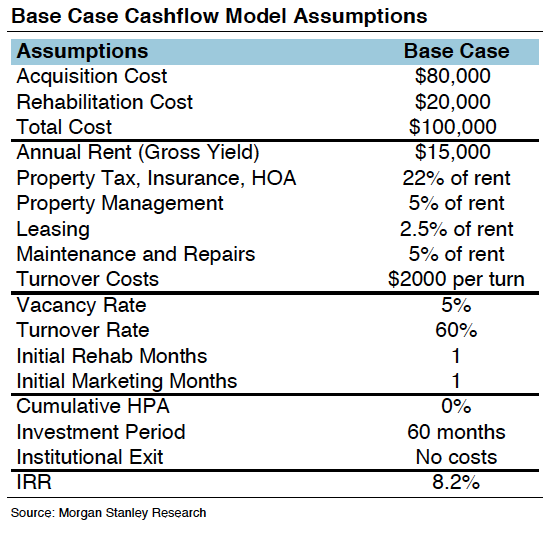 See cashflow model assumption below. Many investors still feel that single-family rental properties are an “under-owned asset class” and that that investing in single-family homes and holding them as rentals for 10 years could produce double-digit investment returns, even if U.S. home prices only improved marginally. Other reason that their is so much momentum by both Main Street and Wall Street investors in single family hones is that America is becoming a Renter Society, with declining homeownership and rising demand for rentals.